This entry was posted in Worcester Acute Trust News and tagged antidepressants, depression, recovery, self care, strategies, stress. Bookmark the permalink. Thanks so much for sharing this Janet. Takes courage. Really appreciate it. Hope it gives help to others who are in a similar situation. Wow. This sounds so familiar. I finally plucked up the corage to see my gp last year and was diagnosed with PTSD. Was prescribed a course of medication and therapy. My therapist described my head as a messy pant draw! But it makes so much sense. My draw is much neater than it’s been in a long time but I have lots of self help strategises as you described to help me when things get a little messy again! It’s great that you’re sharing your experience as there’s still a stigma surrounding mental illness – thank you for that. Many people who have never experienced it tend to take their mental health for granted. For some mental illness is chronic, like diabetes or arthritis, and for others, it may be like a broken leg or flu. None the less, those people are visibly and tangibly ill. I suppose you don’t always know someone is depressed or what they’re like when they aren’t speaking to you. As long as someone can hold a conversation, has had a shower and put clean clothes on it’s easy to assume that all is well when it isn’t. Great blog, and it reminds me… I was caring for my mother and coping less and less as she was reaching the point where she needed full nursing care. Fitted in time for a haircut when my hairdresser told me I was losing too much hair, was clearly over stressed, and that I had to do something or he would withdraw his labour! Since he’s the best hairdresser ever, it nudged me into making me to call a family conference to discuss next steps for Mum. Not a great example of self care, but at least I listened when my hairdresser, ( may be God sent) spoke…. 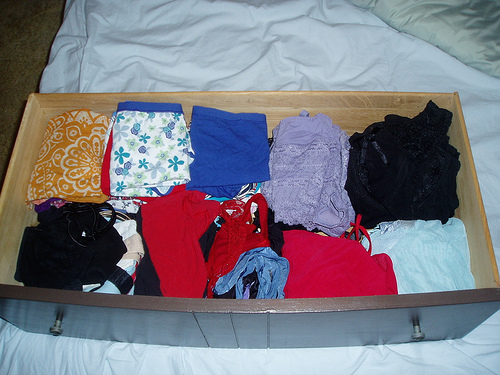 I was just thinking this morning that my pant drawer is rather messy. Now I’ve clicked why. Thank you!